Bat DA 50 drone director of Bathawk Recon and Elephant Survivor Organisation Mike Chambers with Martin Loibooki, then Tanapa director of conservation, and rangers during the tests. Loibooki is currently the director general of the Tanzania Wildlife Authority. Arusha — Full scale surveillance against poachers using drones will commence at the Katavi National Park before long. This follows approval of the American-made Super Bat DA-50 version of unmanned aerial vehicle (UAV) as the most viable among the drones tested in the country since 2014. "The machine (Super Bat) has proved viable due to its robustness and endurance," said Mike Chambers, the man behind the initiative and director of Bathawk Recon and Elephant Survival Organisation (ESO), a non-governmental body. He said the drone now recommended to be deployed at Katavi was successfully tested at Mkomazi National Park in September, 2015. That was during the third and the last test to be carried under the initiative, mainly targeted to save the endangered rhinos and jumbos. The deployment of the machine, he explained, had also been approved by the Tanzania National Parks (Tanapa), Bathawk Recon and experts on Super Bat DA-50. "The range of the plane suited the usual terrains of our national parks. We looked to measure how well we can see people. Its cameras could easily detect humans on the ground," he told The Citizen on Friday. In addition, he said, Super Bat DA-50 was able to cover a huge area, which promises an effective fight against illegal hunters who have eluded game rangers in killing elephants and other animals in the vast parks and other protected areas. 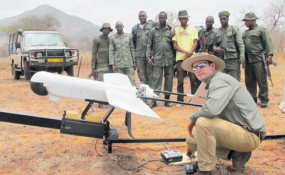 Mr Chambers said the approved drone would be deployed to the Katavi National Park within the next six months following an agreement signed recently between Bathawk Recon and Tanapa on deployment of the drones to counter poaching in the next three years. The first test on the use of the drones against poachers took place at the Tarangire National Park in October 2014, followed by two others at Selous Game Reserve and Mkomazi National Park in May 2015 and September 2015 respectively. However, he said, the new anti-poaching war using the drones was being directed at the 4,471 square kilometre Katavi National Park because it was where the killing of animals by poachers was still rife compared to 15 other sanctuaries managed by Tanapa. Katavi is the third largest national park in Tanzania and located in the western part of the country. It nevertheless does not attract many visitors. For decades, poaching at the park had been fuelled by presence of refugees from the conflict ridden neighbouring countries. Although it does not have a rhino sanctuary, the park is famous for having a big population of elephants and other animals targeted by poachers. They are lions, giraffes, zebras, leopards and cheetahs to mention but a few. "By using this machine (Super Bat DA-50), Tanzania is going a step forward in fighting poaching. You don't need helicopters or light planes," he pointed out. He argued that the introduction of the drones is in line with the now preferred intelligence-based anti-poaching efforts such as aerial surveillance rather than deployment of rangers and heavy equipment on the large areas on the ground. "The hardware and software we propose in the Super Bat DA-50 will integrate with the ground teams and rangers to bring a true intelligence-led tool to protection area authorities," he explained in an interview. According to Idrisa Jaffary, a liaison officer with ESO, if the initiative is successful, drones would mainly be deployed to areas where wanton killing of wild animals is still rampant. These include Katavi and other national parks. He added once it commences, full-scale surveillance at the park would involve at least 10 experts, including aircraft communication officers from the US-based manufacturers of the UAVs. Besides Tanapa and Bathwak Recon, UAV anti-poaching surveillance initiative has also involved the ministry of Natural Resources and Tourism, the Tanzania Civil Aviation Authority (TCAA), the Military and the Tanzania Private Sector Foundation (TPSF).